Go on to see and shop the wedding veils that’ll be trending in 2018. A Cathedral-length veil elegantly frames the rest of the look with the addition of a scalloped lace edge. Modern brides will try this alternative to a traditional hairpiece veils by draping the lace-embroidered fabric this way. Opt for subtle touches of floral embroidery to match the shade of your dress (if it's not a true white) to tie the whole look together. According to Brown, we're going to see a lot of 3D embellishments on extra-long tulle veils this year. With hand-cut embroidered florals scattered artfully about the edge, this dramatic veil will definitely take center stage in any wedding photos. Cut from lightweight ivory tulle in a chapel length, it's embroidered to resemble antique lace and embellished with iridescent sequins to catch the light as you walk down the aisle. Pared-back embroidery works best on chapel-length veils. This one with lace appliqués along the edge is perfect for minimalist brides. Gorgeously tiered, this lightly embroidered tulle veil floats elegantly behind you. Bold, almost graphic floral designs ring this veil at shoulder length, revealing the gorgeous neckline of your dress. 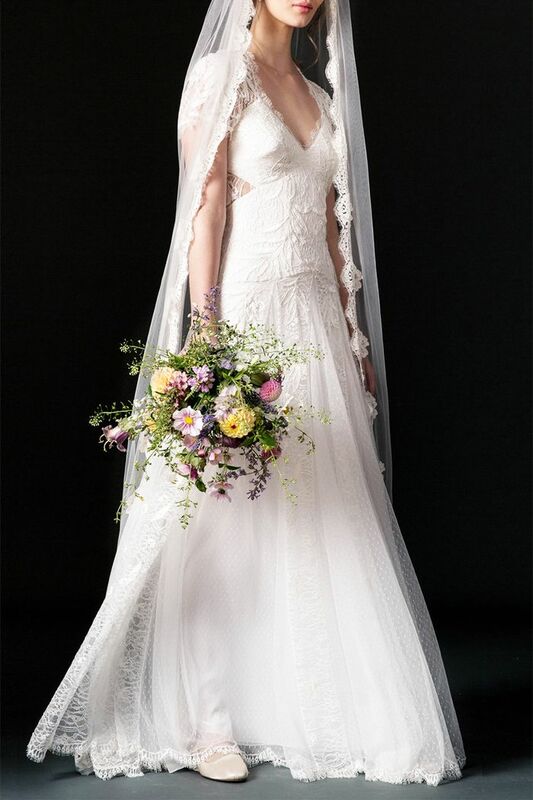 Highlight the romance of this beautiful day with a gauzy tulle veil finished with a scalloped, beaded edge and ornamented with floral embroidered lace. The stunning floral design cascades down the center of this veil, coordinating with the embroidery on its matching wedding gown. Exquisite lace is artfully placed and meticulously stitched into an elegant design that sweeps softly behind you. Lace embroidery fills the latter half of this cathedral-length, gauzy tulle piece. Three-dimensional floral appliqué accents give this chapel length veil a playful feel. Want more wedding inspiration, see these pretty new wedding dresses.